I am a massive Harry Potter fan. I've read, and reread the books many times, been to the studios, dressed up as a death eater, and literally bought the t-shirt(s). At some point there will be a tattoo, but I'm still plotting that one. That leads me onto my other obsession; tattoos. Had my first tattoo at 33 and there was no stopping me from that point! I had no intention of having a tattoo until I found the most remarkable lady through a fiend on Instagram. She was based in London, but this mattered not - I was going. Rebecca has been covering me in flowers and berries for the last two years. I adore that woman. She gets me. She made allowances for my mental OCD when I had my first tattoo, seems to know what I want, even when I don't, and is just bursting with love for others. 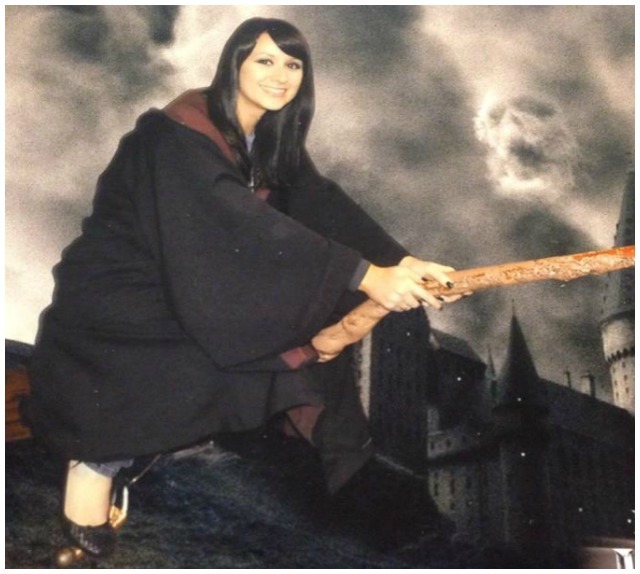 She's one of the kindest people I have ever met, she's remarkable at her art, and shares my love for all thing Potter. I adore baking for folk I like. It makes me incredibly happy to make something I know they'll love. I was always plotting a Potter themed bundt for Rebecca. Her little girl, Rosie is a superfan too, so it had to be something for both of them. Did a bit of Hermione style planning... So, I when I tried actual butterbeer, it tasted of very little, although I got the gist of what it should be like from the description in the books; sweet butterscotch, with a slight spice to it for warmth. Merlin's beard! I'd cracked it. The best bit was the decoration. You do not tone Potter down! I threw everything at the bugger... Bertie Bott's Every Flavour beans (watch out for earwax ones though), jelly slugs, a chocolate frog, a snitch, and a shedload of glitter. Prepare a regular sized bundt tin - 2.4l, 10 cup, 10 inch with melted butter and dust with flour. When the cake is fully cool, tip the Carnation caramel into a jug and give it a stir. It's runny enough to pour. Tip it over the cake with the same urgency as catching the elusive snitch. Quickly is best. Decorate with all the Harry Potter related stuff you can get your wand on. More is more in this case. 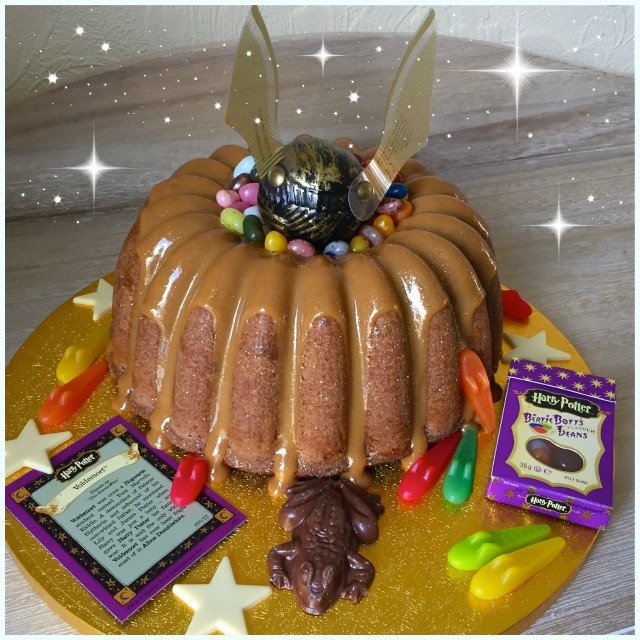 Sprinkle with gold cake glitter and utter your favourite spell.